As Semicon West approaches in two months, there will be a rising chorus of predictions for 450mm manufacturing and test equipment. But silicon wafer industry revenues are heading in the wrong direction, dramatic technology advances in test and reclamation, and an overall urge for revenge among their customers over gouging during the solar boom. In February, SEMI issued its annual report on the state of silicon wafer industry that showed a small increase in the delivery of wafers to customers in spite of a well-known glut of supply, but a sharp decline in revenues that outstripped reasons based on inventory. What is more, this appears to be developing into a trend over the past three years. When questioned about the discrepancy, SEMI replied simply, but cryptically, that it was due to "market pressures and a weak yen.” Yet placing the blame on the decline of Japanese currency seemed knee-jerkish at best. While it is true the yen has plummeted over the past 20 years, the decline has relatively flattened out over the past five years. Japan, while still the leading supplier, has seen a significant increase in competition worldwide especially in China, Malaysia and even the US, modifying the yen's influence even more. The extremely vague explanation "market pressures" is even more suspect. Let’s take a look at test, for example. A joint study by Hewlett Packard, the University of Oregon and the University of California, San Diego showed that applying data mining to optimize IC test resulted in significantly higher yields on virgin wafers. At ITC in 2013, Craig Nishizaki, Senior Director of ATE Development at NVIDIA, extolled the benefits of test data management methodologies. Higher yield through improved test reduces demand. Although, you wouldn’t know it talking to people in the test management industry. Jim Reedholm, an independent representative of Yieldwerx, based in Austin Texas. “I haven’t seen any data that would backup any claim that effective test management would reduce demand for wafers, but it sounds right.” Executives at other semiconductor test management technology companies were either unresponsive or, strangely enough, unlocatable. OK, so maybe no, maybe yes. How about reclaimed wafers? According to Semico analyst Joanne Ito, improvements in reclamation processes for silicon wafers has dramatically dropped the demand for test wafers for semiconductor manufacturing and, according to SEMI, both revenue and material shipments are up 14 percent from last year. Ito believes that will be a trend going forward, but SEMI predicts that increase will flatten out by 2015. We might be getting closer to a reason for the discrepancy between revenue and shipments. 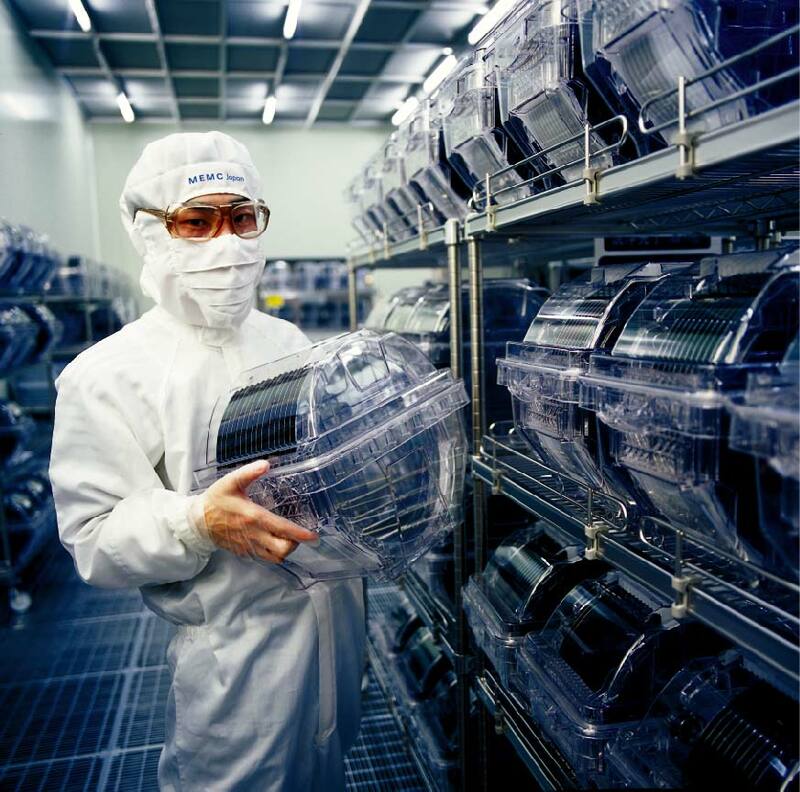 According to Ito, during the solar boom up to 2008 there was a significant lack of raw material for wafers, which drove up prices for the high-quality virgin wafers that the semiconductor industry needs. That same solar demand ate up the capacity for 200mm and 300mm manufacturing. When the boom blew out, demand for the raw material dropped and a huge overcapacity developed in 200-300mm facilities. OK, so oversupply tends to push down prices and revenues. Econ 101. There is only one problem. Demand has not decreased in the semi industry. It is increasing as demand for smart devices worldwide drives semi design starts. Hence, the steady increase in shipments to semi customers. Why the dramatic drop in revenue? Ito thinks the answer might be vengeful purchasing executives in semiconductor companies. Now we have a better idea what “market pressures” are actually in play. The opportunity to return to the wafer manufacturers what they forced upon their customers a decade ago is too good to resist. Do you agree there is an element of vengeance going on, or do you see other factors at play? Leave a comment and tell us what you think. Accellera Systems Initiative, the non-profit standards organization for electronic design automation (EDA) and intellectual property (IP) standards, has taken over the moribund Open Core Protocol International Partnership (OCP-IP). OCP-IP was originally started by Sonics, Inc. in December 2001 as a means to proliferate it's network-on-chip approach. Sonics CTO Drew Wingard has been a primary driver of the organization. It has long been perceived as the primary marketing tool of the company and it will be interesting to see how the company (which has been on and off the IPO trail several times since its founding) fairs without being the "big dog" in the discussion. Extension Media and Footwasher Media worked jointly on a project at DAC 2012 to look at where innovation is coming from in the foreseeable future. New Tech Press Managing Editor Joe Basques asked Extension Media Chief Content Officer John Blyler for his take. Yesterday we ran a report about whether chip design could be effectively reduced to the point of profitability for innovative designs. Conventional wisdom said that possibility will not come around for at least 10 years. But in our year-long investigation we stumbled across a very quiet company, Yotta Data Sciences, and its founder and CEO Tom Grebinski, that might have a solution that would speed the process up within a couple of years. Grebinski has put his thumbprint on the semiconductor industry for a couple of decades. He dealt with how ICs are physically composed by pioneering atomic layer deposition technology in the 1980s, he moved to developing a way to handle yottabytes of data as the author of the the OASIS integrated circuit layout format standard of SEMI. Now he’s taking on how that data can be managed, distributed and protected efficiently and effectively. At the Design Automation Conference in June 2012, Verilab’s JL Gray posed a perfectly unreasonable question: “Can you build a chip to verified prototype for less than $10,000 that an investor would want to back as a product?” Over the past few months a variety of experts on the subject came to consensus and, as it turns out, the answer is yes and no. Yes, you can build one to prototype, but no, an investor would not find the product interesting. How about building a chip interesting to an investor for under $25 million, which Gary Smith, chief analyst for GarySmithEDA, calls the tipping point for investors. Again, the consensus was in agreement: Yes, but not for at least 10 years... maybe 20. DAC had a significant contingent of companies pushing FPGA prototyping tools and several pundits claiming that using FPGAs immediately reduce the cost of development. In an interview a few months later, Smith concurred that people are making $10K chips with FPGAs and free tools “all the time,” but those tools did more good in developing chips at the 90nm and above node and nothing to reduce the cost of bringing a chip through manufacturing to market, which is the bulk of the cost, especially at the more advanced nodes. (link to Smith videos) That’s the rub, but progress is being made. Reducing the overall cost of chips, from development to manufacturing, has been the goal of everyone from the smallest EDA company to the largest foundry. But, every advance in process node means investment in even more expensive and potentially unproven technology. Almost every EDA product release promises to reduce cost by $10 million, depending on the application, theoretically. As early as 2009 the total overall cost for bringing an advanced chip to market exceeded $50 million. Smith states that the cost has been reduced to as little as $28 million. Much of that cost reduction, he identified as coming from three directions: effective and low-cost tool packages, the advancement of ESL tools raising the level of abstraction, and the return of independent design services reducing NRE costs. It cost an average of $10 million to acquire enough EDA tools to do a decent job on a new chip 10 years ago. Smith said you can achieve success with packages below $20,000 now for chips at 90nm and up to 2 million gates. Below that node, and above that gate count it gets dicey. Kaiser pointed out that small companies, like Adapteva are using innovative tools as well as innovative ways of raising funds to develop new products (Maxfield article) to keep costs low. Adapteva’s first chip to market cost less than $2 million. But those cases are the exception rather than the rule. Design services are rising to the forefront again to the level that Smith calls the niche, the “wild west” of the EDA industry with new companies coming to the forefront not only in Asia but in the US as well. Josh Lee, CEO of Uniquify, a design service company, echoed Smith saying a design services company can not only simplify but standardize the design process, objectively evaluate what the right tool will be and compensate faster for specific tool weaknesses. This eliminates a significant amount of NRE cost especially for an OEM that doesn’t specialize in chip design. Several companies are divesting themselves of chip design departments and outsourcing the services to design firms. Earlier this year TSMC added Uniquify as a design partner and LG Electronics selected the company for memory IP design. A common thread, however, through all the comments and predictions on the issue of lowering the cost of semiconductors is NRE. That boils down to the time it takes for an engineer or a team of engineers to coordinate and produce a design. Tools can go so far. Outsourcing can go so far. Methodology, IP and design platforms can go so far. None of them have even come close to dealing with one major problem: The amount of data engineers have to deal with. While chip design is focused on increasing speed and computing power, Brech said efficiency and cost control are the biggest concerns of the end customer now. Brech said the chip industry is still focused on incremental increases in performance but the improvements we see in semiconductors, 200ms to 300ms, is imperceptible to the end user. Brech stated that 70 percent of the IT budget is devoted to operations and maintenance of data centers while complexity of managing massive amounts of data grows steadily by orders of magnitudes. He said 22 billion devices are connected to the internet now, downloading and adding data every second. Applications such as cognitive computing and big data analytics are compounding the problem. The solution, he stated, is in alternative designs that are cloud ready, data ready and security ready. Those are the applications technology needs to focus on. ESL startup Esencia has been making noise about the changing of the guard in IC design as the industry moves from RTL to ESL. In this third part of our series on the Quest the the 10K Chip, Karl Kaiser, VP of engineering for Esencia, talks about Gary Smith's view of the cost of IC design and where ESL can continually lower that cost. At the Design Automation Conference in June 2012, tech blogger JL Gray posed a question: Can you build a chip to prototype, that would interest a potential investor to take it all the way to production, for $10,000? The question launched a 6-month investigation by New Tech Press to get an answer. Dozens of entrepreneurs, analysts, investors and engineers accepted invitations to discuss the subject. While most wished to remain anonymous a few agreed to go as far as to be captured on video. We will be rolling out the series for the next few weeks with links to several articles in other publications. The video platform we are using is from meBox! Media that will allow viewers to interact with and share the content on a broad level. We encourage your input in comments on this site, however if you wish to remain anonymous, you can send private comments directly to us by clicking on the email button on each video. Hover your cursor over the screen to expose the engagement buttons. The series we start today is the best of those meetings, anchored with a three-part interview with Gary Smith, chief analyst for GarySmithEDA. Gary starts with the basics of the question, starting from the use of low-cost FPGAs and free tools, through the actual costs of manufacturing and ways to keep tool costs low. A successful trade show is one where industry news seems to point to a positive future. As such Semicon West 2012 was successful. The conference was abuzz with announcements supporting the transition to 450mm wafer production and extreme ultraviolet (EUV) methodologies. Intel announced a 10 percent equity investment to speed up ASML 450mm tool development, KLA Tencor announced QA technology for 450mm and Cymer announced that companies were buying their EUV source tech already. Several analysts claimed that in a couple of years, the foundation will be established for a complete transition by 2020 at the latest. But out of all the positive vibes there were some questions. In the chicken-and-egg category was whether EUV will be production ready before 450mm tools. In the is-this-trip-necessary category, whether 450mm is even necessary if EUV is productive at 300mm. KLA-Tencor is firmly in the “450mm is necessary” camp. The company launched the the Surfscan SP3 for 300mm defect and surface quality characterization requirements just last year and followed up with an announcement of the version for 450mm at Semicon this year. Cymer is working concurrently on EUV technology as well as 193nm immersion technology (they announced a focus drilling tool for that process at Semicon) for 300mm wafer production, both of which will migrate relatively easily to 450mm. Mack said that Cymer has provided the light sources for five of the 6 tools ASML has shipped to customers, but those tools are producing wafers at the rate of 5 per hour. The original spec was that the pre-production tool would produce 60 wafers an hour. So today we are at only pre-preproduction levels. Cymer has promised to upgrade the tools to reach that pre-production number by the end of the year to achieve the level of 60 wafers, which is probably enough to allow these customer to develop a process for 14nm, he estimated. Mack said, however, there was no reason to link the success of EUV to 450mm acceptance since there were several alternatives to EUV that are further along, including 193nm immersion lithography. "Frankly, I'm a little surprised at the interest in 450mm recently. To me it represents a feeling of desperation on the part of the fabs looking at the 10nm node and beyond. The number of companies considering that node is practically zero. No one can figure out how to make chips at that level profitably. In the past, increasing the wafer size lowers the cost of equipment but I'm not sure that will work this time." Mack posited that moving to 450mm before 2020 may not be necessary if the new techniques are adopted at 300mm. "If everything goes flawlessly to plan, it would be possible to imagine these technologies in use by 2015. History shows, however, it rarely goes according to plan." When most people think of countries with robust technology industries, they consider China, Japan, Korea, the US, Germany and India. Ireland does not leap to mind. However, Ireland is producing more fast-growing technology startups than any other country in the European Union. The top five and 4 of the top 5 semiconductor firms have a significant presence in Ireland and technology products are 25 percent of the country's exports. Out of all that only 233 of Ireland's 5,500 technology companies are based outside of the country, according to ICT Ireland. ICT Ireland reported in 2011 that the country has significant skills shortages in a variety of technology areas including manufacturing, engineering, IT project management, and business management skills, meaning the doors are wide open to skilled immigrants. That reality has created a significant infrastructure, supported by the government and academia, into making native technology companies successful and attracting foreign technology companies to set up shop in the Emerald Isle. One of those organizations is the Tyndall Institute, based in University College Cork. Tyndall uses its facilities and expertise to support industry and academia internationally to the development of Ireland’s national economy. More than 200 industry partners, customers and several Irish start-up companies have products based on technology originating at Tyndall. In just the area of semiconductor research and design, Tyndall has services related to wafer fabrication, assembly and packaging, re-engineering and failure analysis, IC test and measurement and thermal characterization. Recently, Tyndall sent representatives to the Design Automation Conference in San Francisco to meet with the Electronic Design Automation industry and introduce its services. New Tech Press' editorial director Lou Covey met with Ted O'Shea, the head of Tyndall's Design Technology Evaluation Group to discuss his division's involvement in IP investigation. This year, as almost every year Gary Smith of Gary Smith EDA states that electronic system level (ESL) design is now here. Reality has not always agreed but there are often many signs that say Gary might be on to something. One of them was a tiny startup on the DAC floor called Esencia technologies with an interesting tool kit called Escala. Among their claims was that Escala could make it possible to replace ASICs with low-end FPGAs in low-volume production systems. Lou Covey from Footwasher Media checked them out in this video interview. Sun Microsystems had been an active partner and participant in the EDA world until Oracle completed its acquisition in 2010. Suddenly the Sun logo disappeared quite conspicuously from the EDA exhibitions in 2010 and 2011 where Sun had previously been prominent and ubiquitous. A little of that came back in 2012 with Univa taking their first active presence at the Design Automation Conference. In 2007 Univa helped Sun create the Sun Grid Engine, a job resource and management tool, developed the software to meet Sun’s HPC go-to-market requirements and became a reseller of the engine. In 2010, however, Oracle decided the grid engine division was not as profitable as they would like and dropped it altogether, giving Univa an instant gift of thousands of dedicated users and a rapidly growing service business. Nearly 30% of the company’s customers are in the EDA / Semiconductor space. In January 2011, Univa hired the Sun Grid Engine team and redesigned their business model to continue to support and update the Grid Engine. over the following year Univa delivered more code to their new community than any third party, patching holes and adding new functionality, something that had not been done for close to 2 years. In March of this year, Univa released the results of a Technical Computing User Survey, that showed 70 percent of the respondents expected an increase in use of high performance computing this year and 75 percent expected an increase in 2013. No one indicated a decline in use. The information of the survey was instrumental in Univa's decision to begin making their presence in the EDA industry obvious and the plan, according to Gary Tyreman, President and CEO is to grow that presence steadily. New Tech Press's Lou Covey sat down with Tyreman to talk about Univa and where the EDA industry is headed. ProFPGA came out of stealth at the Design Automation Conference (DAC 2012) in San Francisco with a technology agnostic hardware system for developing FPGA prototype. ProFPGA is a spinoff from ProDesign Europe (http://www.prodesigncad.de), located in Germany. The system that can be used with Xilinx or Altera FPGAs and can be implemented with any commercially available development tool, including those from Synopsys, Xilinx or Altera. Flexras Technologies hit the 2012 Design Automation Conference (DAC) with the Wasga Compiler, an FPGA prototype partitioning tool, with some big claims. Turns out the claims were true... sort of. Their partner, Xilinx, confirmed the tool did provide good results quickly. So the hyperbole in their press release can be forgiven. New Tech Press editorial director Lou Covey interviewed the CEO, Hayder Mrabet.